I often get asked about my creative process, especially with regards to illustrating picture books; but it's not always easy to explain everything without sitting down and talking for an hour or two. 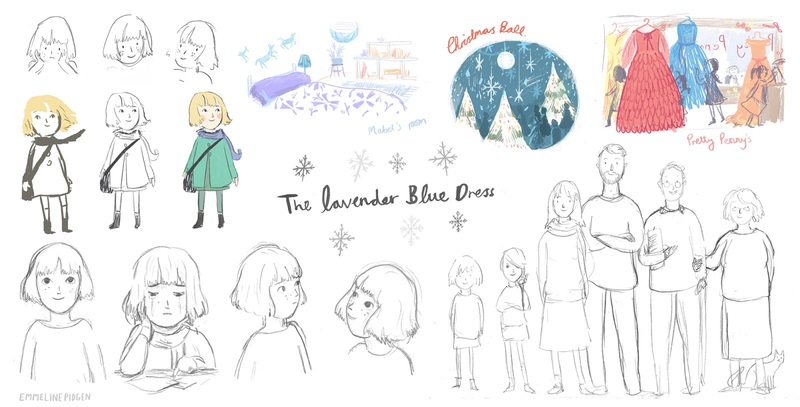 So when Cargo Publishing asked if I could give a little insight into my picture book illustration process and talk about the early concept art for The Lavender Blue Dress, I thought it would be a great opportunity to get everything down on paper and share some of my advice. The article has been up on the Cargo Publishing website for a little while, but wanted to share it here with my other creative tips as well. This will hopefully prove useful whether you're just breaking into the industry, need a technique refresher or just fancy a little insight into how picture books come to life. Illustrating a picture book is incredibly fun, as you might imagine. With the author’s text in a folder to your left, a pile of neatly sharpened pencils on your desk and a blank storyboard in your hands: you’re standing at the edge of infinite visual possibility. That said, just beneath the fun is the knowing simmer that you’re shouldering an awful lot of responsibility. It takes a lot of time to really understand the intricacies involved with designing a picture book. I know that when I was younger I assumed it would be easy, but it’s one of those things where the more you learn about it, the more you realise there is so much left to learn. When I started work on The Lavender Blue Dress with Aidan Moffat and Cargo Publishing, I was lucky in that I knew I was working with a team who would grant me creative freedom, and trust in my skills as an illustrator. Aidan had great initial ideas for some of the scenes and for Mabel’s character design, and we always felt comfortable in discussing each element; working together to make the book as amazing as it should be. I think ultimately that’s been one of the reasons the book has ended up being so special: each of us had so much faith in the project, and the trust that we would all be working together to make something we’re truly proud of. I usually start a book illustration project by sketching out each and every idea that sparks when I first read the text. It’s surprising how often these very rough early ideas can ignite and become some of the most pivotal visuals in the book! After a few basic storyboards (which, if I’m honest, wouldn’t really be legible to anyone but me) I arrange a rough storyboard to send to the client, along with notes and a number of preliminary character designs. There’s a lot to consider when you’re storyboarding a picture book. The visuals you use can drastically alter the pace and flow of the book: pages with small, multiple vignette illustrations tend to pick up the pace; whilst full bleed, highly detailed landscapes will slow the reader down. Same goes for use of colour, composition and shape to reflect the emotion in the story. Soft rounded shapes and warm, tonal colours will suggest a cosy, safe, slowed environment; whilst angular shapes and more hectic composition will make the reader feel more alert, emphasising dramatic situations. You can see in this Lavender Blue Dress double page spread that I’ve used a faster-paced visual style on the left, with small illustrations showing a sort of flashback of Mabel’s family working excitedly on a surprise before she gets home; alongside a single page of warm colours and a rounded background, to really make the reader emphasise with the love and thankfulness that Mabel has for her family at this point in the story. Contrastingly, in the spread below you can see I’ve taken the time to slow the reader down with a sparse, horizontal landscape and cooler colours to suggest time and the solemn thoughts of Mabel’s melancholy walk home. Thinking about the ‘camera angle’ (if you consider each page like a film shot) is really important too. Close-up shots of the character suggest a really personal connection between the character and reader, as if they’re talking just to you (you’ll be able to see this in action at the end of the book, I won’t spoil it for you!). Straight horizontal shots often give the reader a sense of the movement of time, or with a bit of an angle work very well in setting the scene and showing some of the story’s environment to the reader. It’s exciting to work with such a vast intangible toolkit to be able to speak the volumes of a story that the words don’t say. What good is it to just illustrate exactly what each line says? There’s so much space for innovation and the suggestion of story-within-a-story, which for me is the absolute joy of being an illustrator. The Lavender Blue Dress has been one of my very favourite projects to work on in my career. Everything came together so easily and ran so smoothly that you’d think something would go hideously wrong – but it didn’t at all, and we couldn’t be prouder of the picture book we’ve created. You can see the full article and grab a copy of The Lavender Blue Dress on the Cargo Publishing website here. You can also find this, and many more of my creative articles on Medium. If you want to ask me anything, or receive some tailored advice drop me a comment on this post! It's also great to know you've enjoyed working on The Lavender Blue Dress so much! Glad to hear it's helped! It was a really great project to work on, so nice to see people enjoying it now it's published. Thanks!